A low-carbohydrate diet (LCD) achieves good glycemic control in type 2 diabetes (T2DM) compared with a high-carbohydrate diet. With respect to energy metabolism, acute metabolic responses to high-carbohydrate meals (HCMs) have not been determined in LCD patients with T2DM. We enrolled 31 subjects with T2DM (mean age: 62 yrs, mean hemoglobin A1c level: 6.9%), of whom 13 were on a strict LCD (26% carbohydrate diet), and 18 a moderate one (44% carbohydrate diet). Two isocaloric meals were administered to all subjects in a randomized crossover design. The carbohydrate:protein:fat ratios of HCMs and low-carbohydrate meals (LCMs) were 59:20:21 and 7:20:73, respectively. Serum β-hydroxybutyrate, acetoacetate, free fatty acids (FFAs), triglyceride and insulin, and plasma glucose concentrations were measured for 120 minutes after the intake of each meal. HCMs rapidly decreased postprandial β-hydroxybutyrate, acetoacetate and FFA concentrations within 2 hours in all patients in combination with rapid increases in serum insulin and plasma glucose, while LCMs increased or did not change β-hydroxybutyrate, acetoacetate and FFAs (P < 0.001 for all). HCMs did not change postprandial triglyceride concentrations over 2 hours, while LCMs gradually increased them (P < 0.001). HCMs sharply and rapidly decreased postprandial β-hydroxybutyrate and acetoacetate concentrations in strict LCD subjects over 2 hours, but only slightly decreased them in moderate LCD subjects (P < 0.001, difference between strict and moderate LCD subjects). The parameter Δketone bodies (level at 120 minutes - level at baseline) was significantly correlated with the insulinogenic index (Spearman's r = 0.503 for β-hydroxybutyrate and 0.509 for acetoacetate), but not with total insulin secretory capacity. Moreover, HCMs slightly decreased postprandial triglyceride levels in strict LCD subjects but somewhat increased them in the moderate LCD subjects (P = 0.002). The parameter Δtriglyceride was significantly correlated with background dietary %carbohydrate (Spearman's r = 0.484). HCMs rapidly decreased postprandial ketone body concentrations in T2DM patients treated with a LCD. The decreases were more remarkable in strict than in moderate LCD subjects. HCMs slightly decreased postprandial triglyceride levels in strict LCD subjects. The parameter Δketone bodies was significantly correlated with the insulinogenic index, as was Δtriglyceride with background dietary %carbohydrate. Low-carbohydrate diets (LCDs) are known to be more effective than high-carbohydrate diets (HCDs) in improving glycemic control in type 2 diabetes mellitus (T2DM) [1, 2]. Our carbohydrate-reduced diet (CARD) also showed efficacy and safety over 2 years in mild T2DM , with an efficacy comparable to that provided by insulin therapy in severe T2DM . An important problem with LCDs, however, is the high attrition rate [2, 3, 5]. Even patients who strictly conform to LCDs sometimes crave a high-carbohydrate meal (HCM), which often triggers the patients to drop out from the LCDs. Although a key adaptation of LCDs is the production and utilization of ketone bodies [6, 7], the potential of such bodies for uses other than as fuels remains unclear . Even moderate LCDs (30-45% carbohydrate diets) are highly effective for T2DM and dyslipidemia [2, 3, 8]. Thus, patients on a less-strict LCD sometimes eat HCMs because they are not required to strictly limit carbohydrates. Nevertheless, little is known about the acute metabolic changes resulting from the change in carbohydrate conditions in such patients. In the present study, our subjects, T2DM outpatients on CARD, underwent crossover meal tolerance tests (HCM vs. a low-carbohydrate meal, LCM) to compare the acute effects of HCMs and LCMs on postprandial serum ketone bodies, free fatty acids (FFAs) and triglycerides. We also compared acute responses between subjects on moderate (non-ketogenic) and strict (ketogenic) CARD. Furthermore, for HCMs, we examined the correlation of postprandial changes in serum ketone bodies, FFAs and triglycerides with an increase in postprandial plasma glucose, insulin secretory capacity and background dietary %carbohydrate. Thirty-one volunteer T2DM outpatients from the Haimoto Clinic participated in the study (Table 1). All patients were Japanese. Patients with severe diabetes complications were excluded. The participants achieved relatively good glycemic control (mean hemoglobin A1c (HbA1c) level: 6.9 ± 0.4%) by implementing CARD for a mean duration of 22 months. They received no insulin, sulfonylurea or nateglinide treatment, and their mean HbA1c level before CARD was 8.9 ± 2.0%. Based on their initial HbA1c levels, 18 were assigned moderate CARD and 13 strict CARD [3, 4]. Nine subjects took glucose-lowering medication (miglitol, metformin and pioglitazone). Plus-minus values are means ± SD. CARD: Carbohydrate-reduced diet, HbA1c: Hemoglobin A1c. *: P for the difference between the moderate and strict CARD subjects. The HCMs and LCMs were prepared at the Haimoto Clinic by an experienced dietitian. The total energy of the two meals was identical, while the macronutrient composition was contrastive (Table 2). The target HCM macronutrient composition followed the guidelines of the Japan Diabetes Society . The background dietary intake of the subjects was assessed using 3-day food records. All 31 participants underwent two-meal tolerance tests at intervals of 7-14 days. They were randomly assigned to two groups: 15 subjects took HCMs and LCMs in the first and second tests, respectively, while 16 subjects received LCMs and HCMs in the first and second sessions, respectively. Each meal test was conducted after a 12-hour overnight fast. The subjects were asked to continue their CARD and physical activity during the study period. After blood sampling at baseline (0 minutes), the subjects were asked to consume the test meal in 10 minutes, and blood was collected after 30, 60 and 120 minutes. All antidiabetic and lipid-lowering drugs were stopped for 24 hours before each tolerance test. Plasma glucose concentration was determined by enzymatic methods (Shino-Test Co. Kanagawa, Japan). Serum immunoreactive insulin was measured using the standard double antibody radioimmunoassay method (Fujirebio Inc. Tokyo, Japan). Enzymatic methods were used to measure serum total cholesterol (Sysmex Co., Hyogo, Japan), triglycerides (Daiichi Pure Chemicals Co., Tokyo, Japan), free fatty acids (Eiken Chemicals Co., Tokyo, Japan), β-hydroxybutyrate and acetoacetate (Kainos Laboratories Inc., Tokyo, Japan). Direct methods were used to assay serum LDL-cholesterol and HDL-cholesterol (Daiichi Pure Chemicals Co., Tokyo, Japan). HbA1c level was measured by high-performance liquid chromatography (Arkley Co., Kyoto, Japan). The study protocol was approved by the Ethical Committee of the Nagoya Tokusyukai General Hospital, and all participants provided written informed consent. Repeated-measures analysis of variance (ANOVA) was used to examine differences in the time course of each substance. The baseline levels of each biomarker were compared between the two meals by paired t-test, and those between the moderate and strict CARD groups were compared by unpaired t-test. With respect to the responses to HCMs, we computed Spearman's correlation coefficients to examine the correlation of the changes in serum postprandial ketone body (Δβ-hydroxybutyrate and Δacetoacetate), FFA (ΔFFAs) and triglyceride (Δtriglyceride) levels with an increase in plasma glucose levels, insulin secretory capacity and background dietary %carbohydrate as assessed by 3-day food records. The parameters Δketone bodies, ΔFFAs and Δtriglyceride were defined as the level at 120 minutes minus the level at baseline. The incremental plasma glucose (Δglucose) and serum insulin (Δinsulin) were calculated as the difference between the baseline and the peak. The trapezoidal rule was used to calculate the incremental area under the curve for glucose (AUC-glucose) and insulin (AUC-insulin). The HOMA-R and insulinogenic index were computed as follows: [fasting plasma glucose (mg/dl)] × [fasting serum insulin (μIU/ml)]/405 and ([serum insulin at 30 minutes] - [serum insulin at baseline])/([plasma glucose at 30 minutes] - [plasma glucose at baseline]), respectively (9). All values were expressed as means ± SD. P < 0.05 was considered statistically significant. The baseline concentrations of all substances were not significantly different between the HCM and LCM tolerance tests (Figures 1, 2 and 3). LCMs increased postprandial glucose and insulin concentrations only slightly (139 ± 21 mg/dl and 6.4 ± 4.6 μIU/ml at baseline, 143 ± 23 mg/dl and 10.3 ± 6.4 μIU/ml after 30 min, 144 ± 23 mg/dl and 11.6 ± 7.4 μIU/ml after 60 min, and 142 ± 22 mg/dl and 11.4 ± 7.4 μIU/ml after 120 min, respectively), while HCMs caused them to increase rapidly (134 ± 20 mg/dl and 6.6 ± 4.7 μIU/ml at baseline, 223 ± 33 mg/dl and 21.7 ± 1.5 μIU/ml after 30 min, 245 ± 42 mg/dl and 33.6 ± 21.8 μIU/ml after 60 min, and 227 ± 49 mg/dl and 34.6 ± 24.9 μIU/ml after 120 min, respectively) (P < 0.001 for the difference between the two meals for both glucose and insulin; Figure 1). HCMs rapidly decreased postprandial β-hydroxybutyrate, acetoacetate and FFA concentrations, while LCMs increased or did not change them (P < 0.001 for the difference between the two meals for all substances; Figure 2). 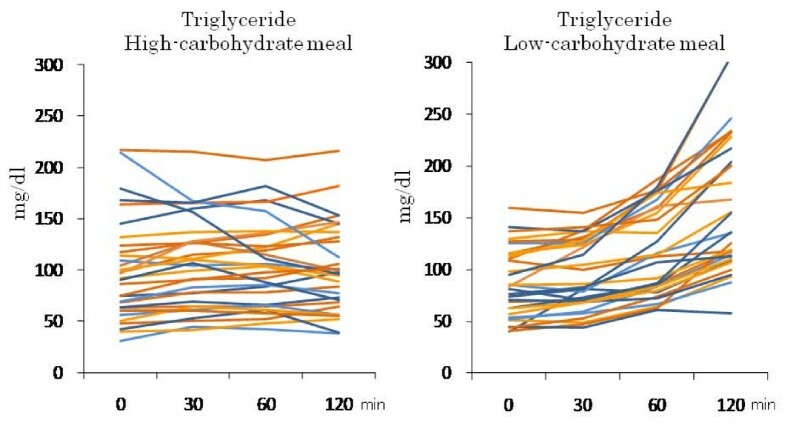 LCMs increased postprandial triglyceride concentrations, while HCMs induced little change (P < 0.001 for the difference between the two meals; Figure 3). Postprandial glucose and insulin concentrations under HCM (green) and LCM (orange) in all individual subjects. HCMs caused postprandial glucose and insulin concentrations to increase rapidly, while LCMs increased them only slightly (P < 0.001 for the difference between the two meals for both glucose and insulin). Postprandial β-hydroxybutyrate, acetoacetate and FFA concentrations under HCM and LCM in all subjects. Vertical lines show means ± SD. 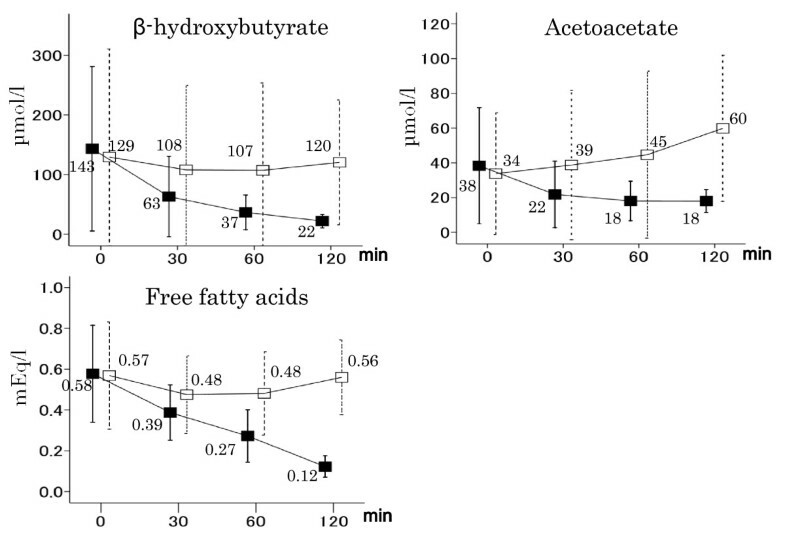 HCMs (black square) rapidly decreased postprandial β-hydroxybutyrate, acetoacetate and FFA concentrations, while LCMs (white square) increased or did not change them (P < 0.001 for the difference between the two meals for β-hydroxybutyrate, acetoacetate and FFAs). Postprandial triglyceride concentrations under HCM and LCM in all subjects. Vertical lines show means ± SD. 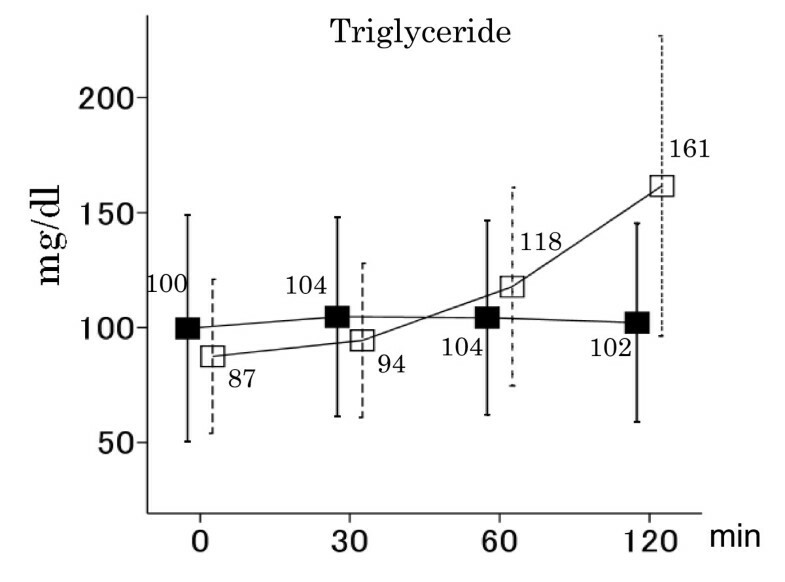 LCMs (white square) increased postprandial triglyceride concentrations, while HCMs (black square) induced little change (P < 0.001 for the difference between the two meals). Background total energy intake was not significantly different between the two groups (Table 1). The daily average intakes of carbohydrates and fat, however, differed greatly, with the strict and moderate CARD groups achieving 26% and 42% carbohydrate diets, respectively. The baseline concentrations of serum β-hydroxybutyrate and acetoacetate were significantly higher in the strict CARD group before HCM and LCM (P < 0.02 for all; Table 3). Those of other substances were not significantly different between the two groups, with the exception that the strict CARD group showed a higher serum FFA level before the LCM test (P = 0.04). Values are means ± SD. CARD: carbohydrate-reduced diet, BHB: β-hydroxybutyrate, FFAs: free fatty acids. *: P for the difference in the time course between the moderate and strict CARD subjects. No significant differences were found in the time courses of the postprandial glucose or insulin levels between the moderate and strict CARD groups after the intake of HCM and LCM (P > 0.05 for all; Table 3). HCMs sharply decreased the postprandial serum β-hydroxybutyrate and acetoacetate concentrations in the strict CARD group, and only slightly decreased them in the moderate group (Table 3, Figures 4 and 5). The time courses were significantly different between the two groups (P = 0.001 for both). 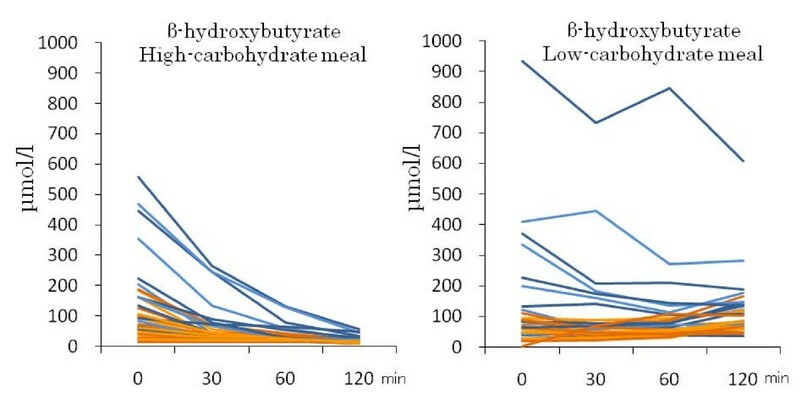 LCMs slightly decreased the postprandial β-hydroxybutyrate levels in the strict CARD group, and increased them somewhat in the moderate group (P = 0.012 for the difference in the time course; Table 3 and Figure 4). LCMs gradually increased the postprandial acetoacetate concentrations in both groups (P = 0.95 for the difference in the time course; Table 3 and Figure 5). The time course of postprandial FFA concentrations was not significantly different between the two groups for both meals. Individual changes in postprandial β-hydroxybutyrate levels in the moderate (orange) and strict (blue) CARD subjects after the intake of HCM and LCM. 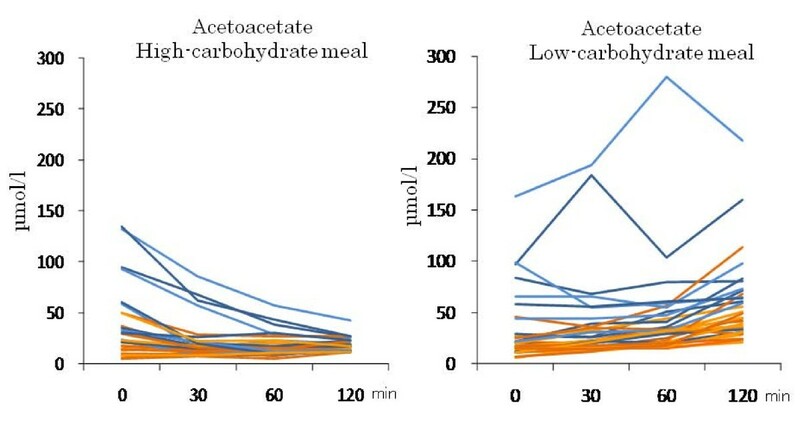 Individual changes in postprandial acetoacetate levels in the moderate (orange) and strict (blue) CARD subjects after the intake of HCM and LCM. HCMs slightly decreased postprandial triglyceride levels in the strict CARD group over 120 minutes, and slightly increased them in the moderate group (Table 3 and Figure 6). The time courses of the two groups were significantly different (P = 0.014). LCMs increased the levels linearly over 120 minutes in both groups (P = 0.89 for the difference in the time course). Individual changes in postprandial triglyceride levels in the moderate (orange) and strict (blue) CARD subjects after the intake of HCM and LCM. Both Δβ-hydroxybutyrate and Δacetoacetate were strongly and positively correlated with the insulinogenic index (Table 4 and Figure 7), moderately and inversely with Δglucose and AUC-glucose and moderately and positively with background dietary %carbohydrate (Table 4 and Figure 8), while they were not significantly correlated with fasting plasma glucose, fasting serum insulin, Δinsulin, AUC-insulin and HOMA-R. Namely, postprandial serum ketone body levels decreased more in subjects with lower insulinogenic indices. The results for Δ FFAs were similar to those for Δketone bodies, but the correlation was somewhat weaker. Values indicate Spearman's r with P values in parentheses. FFAs: free fatty acids, AUC: area under curve. Δglucose and Δinsulin: level at the peak - level at baseline. 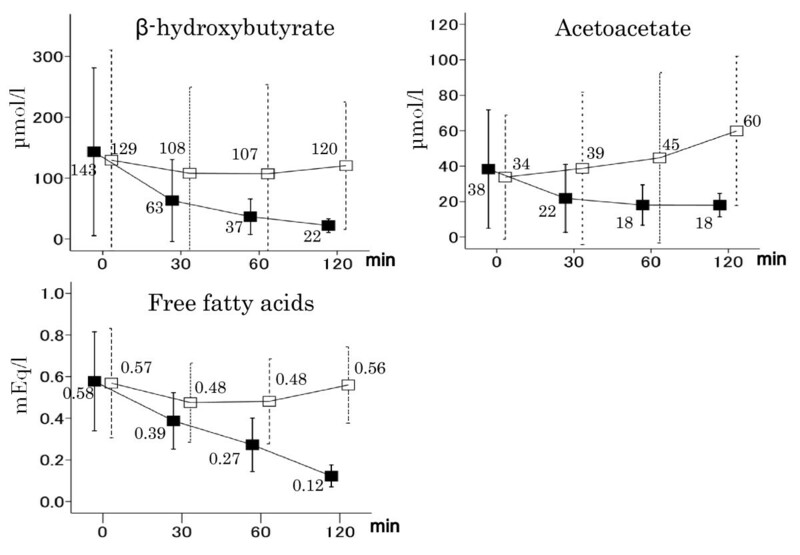 Δβ-hydroxybutyrate, Δacetoacetate, Δfree fatty acids (ΔFFAs) and Δtriglyceride: level at 120 minutes - level at baseline. The relationship between Δketone bodies (level at 120 minutes - level at baseline) and the insulinogenic index after the intake of HCM. Closed and open circles indicate subjects in the strict and moderate CARD groups, respectively. The parameter Δketone bodies was significantly correlated with the insulinogenic index (β-hydroxybutyrate: Spearman's r = 0.503, P = 0.004; acetoacetate: Spearman's r = 0.509, P = 0.003). The relationship between Δtriglyceride or Δβ-hydroxybutyrate (level at 120 minutes - level at baseline) and background dietary %carbohydrate after the intake of HCM. Closed and open circles indicate subjects in the strict and moderate CARD groups, respectively. Background dietary %carbohydrate was strongly correlated with Δtriglyceride (Spearman's r = 0.484, P = 0.006) and was moderately correlated with Δβ-hydroxybutyrate (Spearman's r = 0.380, P = 0.035). Excluding the two subjects with a greatest decrease of serum triglycerides did not materially alter the association between Δtriglyceride and dietary %carbohydrate (Spearman's r = 0.487 [P = 0.007]). Background dietary %carbohydrate was strongly and positively correlated with Δ triglyceride and was moderately correlated with Δβ-hydroxybutyrate and Δ acetoacetate. 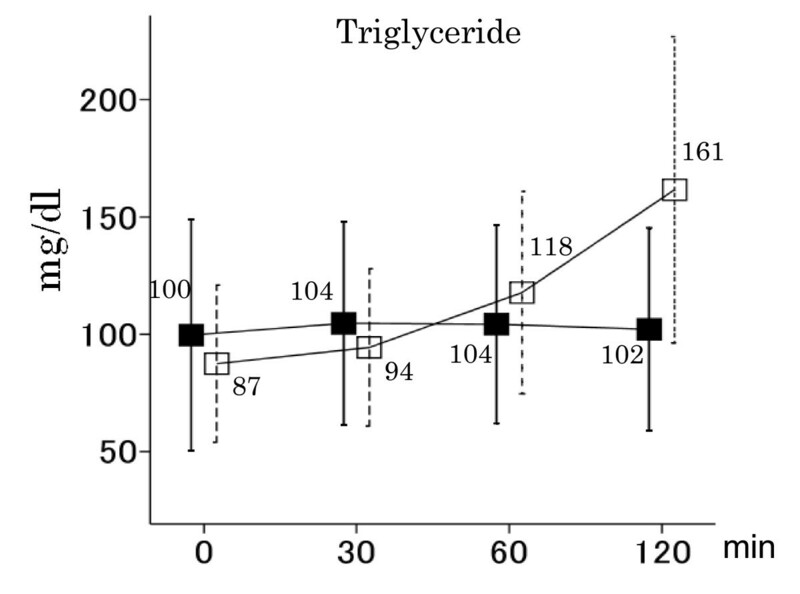 The parameter Δ triglyceride was not significantly correlated with any variables other than background dietary %carbohydrate (Table 4 and Figure 8). This means that postprandial serum triglycerides decreased more in subjects with lower background dietary %carbohydrate. Excluding the two subjects with a greatest decrease of serum triglycerides did not materially alter the association between Δtriglyceride and dietary %carbohydrate (Spearman's r = 0.487 [P = 0.007]). In terms of the baseline levels of ketone bodies, the insulinogenic index was significantly and inversely correlated with baseline β-hydroxybutyrate and acetoacetate levels (Spearman's r = -0.523 [P = 0.003] and -0.513 [P = 0.003], respectively), as was dietary %carbohydrate (Spearman's r = -0.421 [P = 0.018] and -0.443 [P = 0.013], respectively). The limitations of the present study are its very short term and the large SD in serum ketone body levels before the meal tests. Large between-person variations in fasting serum β-hydroxybutyrate levels have been previously reported in outpatients after long-term LCD treatment [10, 11]. Another limitation is that the use of glucose and lipid-lowering drugs may have affected the results. Nevertheless, the present study demonstrated that HCMs including 59% carbohydrates rapidly decreased postprandial serum ketone body and FFA concentrations within 2 hours in T2DM outpatients on CARD. The decrease can be explained in terms of the metabolic changes of ketone bodies and FFAs to glucose to be used as fuel , which is well-known to be largely determined by insulin secretion after the intake of large amounts of carbohydrates [12, 13]. However, our study clarified that the decrease in serum ketone body levels was much more rapid than expected from starvation conditions [12, 14] and was more remarkable in strict (ketogenic) CARD subjects than in moderate (non-ketogenic) CARD subjects. Carbohydrate or glucose administration to fasting normals causes serum ketone body levels to decrease in a few days [12, 14]. Under low-carbohydrate conditions, unlike under starvation conditions, a sufficient intake of protein and fat is likely to be involved in the rapid decrease of serum ketone body levels. The present study also demonstrated that the insulinogenic index was strongly and positively correlated with Δketone bodies while concomitantly showing a strong and inverse correlation with baseline ketone body levels, but total insulin secretory capacity (AUC-insulin) was not significantly correlated with Δketone bodies. A possible interpretation of these findings is that under low-carbohydrate conditions, a lower insulinogenic index is probably a factor in maintaining a high level of baseline ketone bodies independent of dietary %carbohydrate; then, the initial secretion of only a small amount of insulin after the intake of LCMs leads to rapid decreases of serum postprandial ketone body levels. Postprandial triglyceride levels have attracted much attention as a cardiovascular risk factor [15, 16], and LCDs are well known to improve serum triglyceride profiles compared to HCDs [7, 13, 17]. Small amounts of dietary fats (15 g) slightly increase postprandial serum triglyceride levels, but never decrease them in normolipidemic adults . Interestingly, the present study demonstrated that small amounts of fat (12 g) in HCMs slightly decreased these levels over 2 hours in the strict CARD group in contrast to causing a slight increase in the moderate group. Moreover, Δtriglyceride was strongly and positively correlated with background dietary %carbohydrate, but not with an increase in postprandial plasma glucose and serum insulin, insulinogenic index or total insulin secretory capacity. Specifically, postprandial triglyceride levels decreased more in strict CARD subjects with lower %carbohydrate levels, and such patients had higher baseline ketone body levels. Given that ketone bodies provide the same metabolic effects as insulin and inhibit lipolysis [7, 19, 20], serum ketone bodies may play a role in decreasing postprandial triglyceride levels. In contrast, large amounts of fat (42 g) in LCMs increased triglyceride concentrations in both CARD groups. These results raise the possibility of a threshold in the dietary fat level under which postprandial triglyceride levels are not elevated . In summary, when T2DM patients treated with CARD ingested HCMs, rapid metabolic change was induced within 2 hours; a rapid decrease in serum ketone bodies and FFA levels was found in conjunction with an increase in postprandial glucose and insulin levels. The decrease in ketone bodies was more remarkable in strict than in moderate CARD subjects. 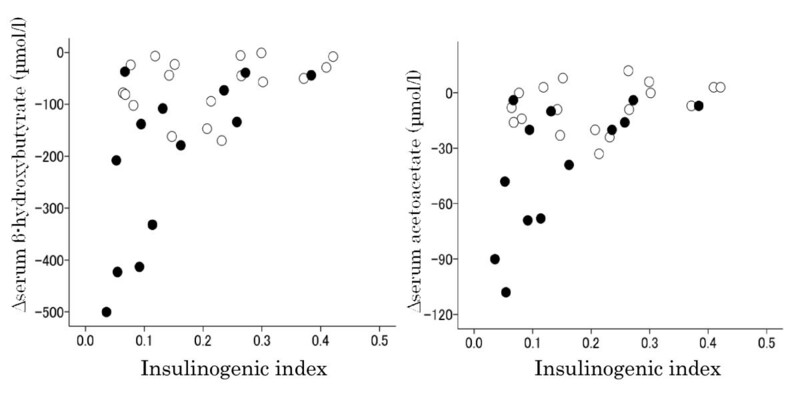 The parameter Δketone bodies was significantly correlated with the insulinogenic index, but not with total insulin secetory capacity. HCMs gradually decreased postprandial triglyceride levels in strict CARD subjects in contrast to causing a slight increase in moderate CARD subjects. The parameter Δtriglyceride was significantly correlated with dietary %carbohydrate. The authors would like to thank the nurses at Haimoto Clinic for their assistance and excellent patient care, and Mrs. Aiko Haimoto for technical support. HH and TS designed the study and participated in data collection. HH, KW and HU performed statistical analysis and interpretation. HH and KW wrote the manuscript. All authors read and approved the final manuscript.